One of the previous owners of our house was an artist, and he converted the North wing into a studio. The room is large, around 580 square feet, and would have originally been used as a barn. In it's current format, the space is at odds with the rest of the house both aesthetically and functionally. It has a cement floor, modern ceiling, and skylights, and isn't accessible through the main house. The 'studio' space that will become our orangerie. Over the 2 months we've been living here, we're been brainstorming how best to use this space. We like the idea of having an open plan area that we could use to work on projects, or host parties, but we don't want to have any rooms in the house that look unfinished or like an 'event space'. 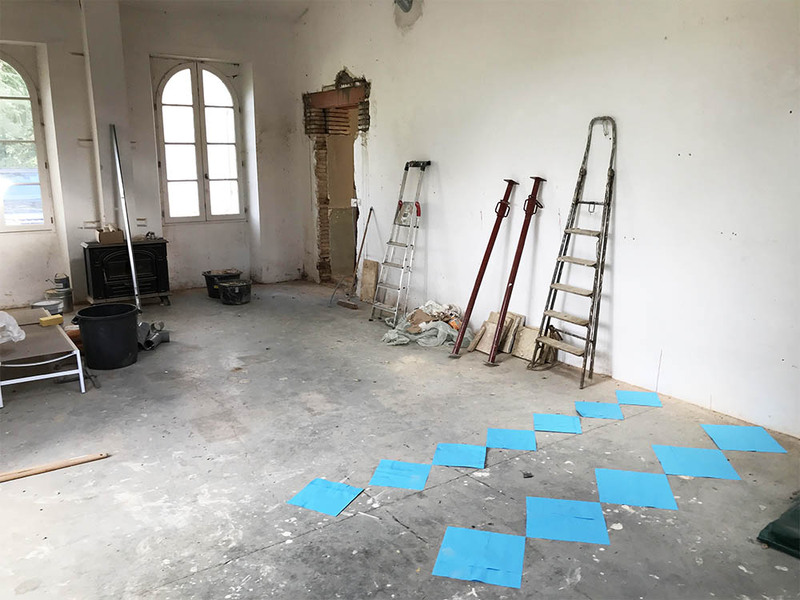 In the end, we have settled on turning the studio into an orangerie, and punching some holes through the dining room wall to create an entrance via the main house. The previous owners were using this room as a library, but we will be using it as our family dining room. We're creating symmetrical glass doorways, on either side of the fireplace, that will open into the orangerie. It's going to be so much nicer to be able to access the orangerie from the main house. Another bonus is all the extra light it lets into this room. 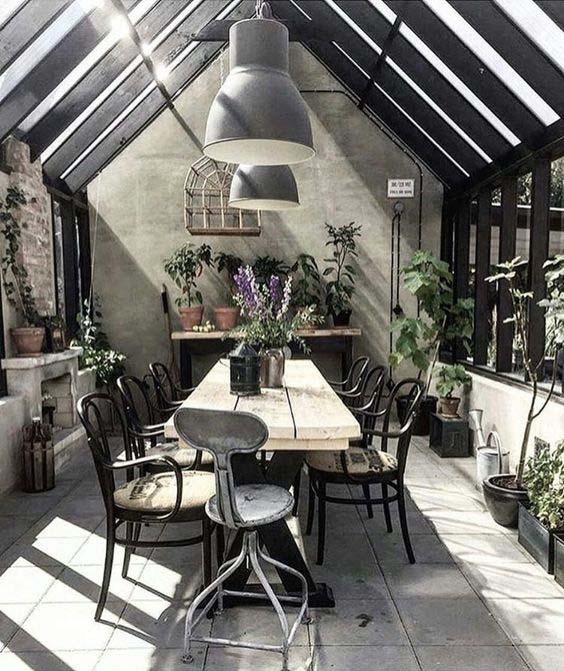 You don't often here about orangeries these days, but they were popular in France from the 17th to 19th century, when people would dedicate a big room, or separate building, to house their citrus trees in the winter months - a bit like a conservatory. When we were house hunting we saw some beautiful original orangeries that had been transformed into event spaces, which is what gave us the idea for this room. Orangery inspiration images via 1, 2, 3, 4. We will furnish the room with a 12 foot dining table at one end, big enough to seat everyone if we have a full house of guests, and a lounge at the other end. The design for our dining table. Dotted throughout the orangerie, there will be a variety of citrus trees in big pots. It will be a brilliant place to host dinner parties and events, as well as a lovely spot to sit and read in the lounge, surrounded by trees dappled in sunlight. 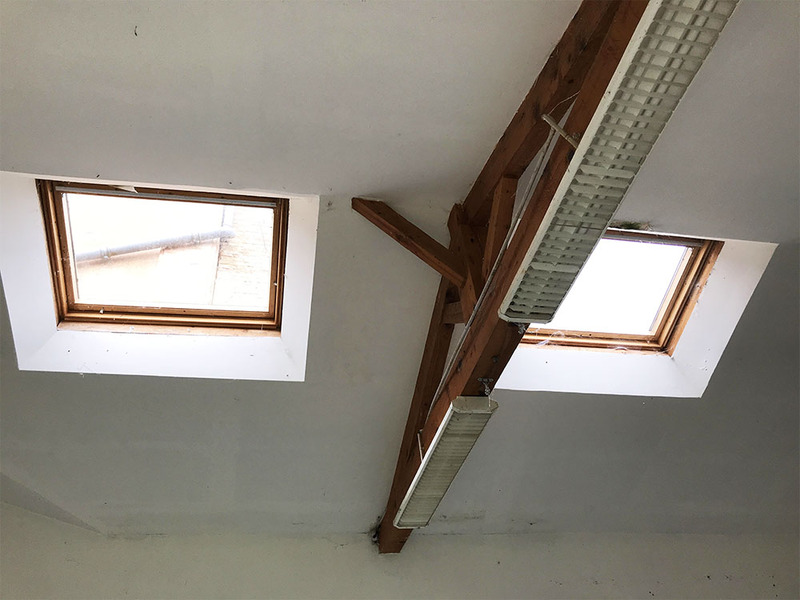 These skylights were installed by the artist, to allow more natural light for his painting, and the space is certainly very light-filled. We'll be removing the big flourescent lights and replacing them with antique chandeliers that are more in keeping with the property's heritage. Tumbled black and white marble tiles. Image via Mandarin Stone. I have been trying to find an excuse to use these stunning black and white 'tumbled' marble tiles somewhere in the chateau, and the orangerie seems like the perfect place. We've ordered 12" squares, and will be laying them on the diamond. We've been debating what size tile to order, so I made some stencils in different sizes to help us get a sense of what they would look like in the space. The wall pictured above will look quite different when the new doorways have been created. We're adding five new glass doors in total, which will let in even more light. At the moment the space looks very modern compared to the rest of the property. I'm excited to undo some of the modernization, and see the room develop into a space that feels more connected to the rest of the chateau. P.S. Rosie's (pink!) bathroom and more photos of the chateau.